Hover your mouse over the Network link from the top navigation bar of any page and then click the Contacts link from the drop-down list that appears. Select the person you’re recommending from the connections list that appears. Your recommendation goes directly to that person, not prospective employers. 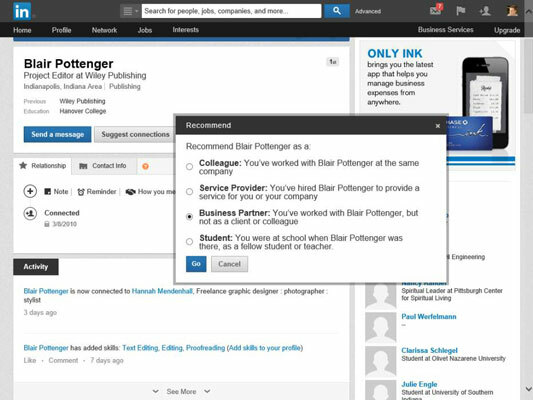 Any prospective employer who wants a specific reference can request it through doing a reference search on LinkedIn. Visit the profile of the person you want to recommend. Before you write up your recommendation, review the person’s experience, summary, professional headline, and other elements of his profile. This helps you get a sense of what skills, attributes, or results should be reflected in your recommendation of that person. After all, if the person you want to recommend is trying to build a career as a finance executive, your recommendation will serve him better if you focus on finance instead of his event planning or writing skills, for example. Click the drop-down arrow next to the Send a Message button in the middle of his profile page, and then click the Recommend link from the drop-down list that appears. Select a category for that person. As soon as you click the Recommend link, you’re prompted to choose an option describing how you know this person. Colleague: You worked together at the same company. This also includes situations where you or the other person was the boss. Service Provider: You hired the person to provide a service to you or your company. Student: You went to school with the person, either as a fellow student or as a teacher. Currently, there is no option for a personal relationship nor for you being a service provider to the person. In these cases, it’s recommended that you select Business Partner. The Create Your Recommendation page appears. Define your relationship with the person you’re recommending by answering a few questions. Define the basis of the recommendation. If you’re a colleague of the person, LinkedIn wants to know whether you managed or worked side by side with the other party, or whether that person was the manager or senior official. If you’re a business partner, LinkedIn wants to know whether you worked at a different company from the other person or whether the person was a client of yours. Define your title at the time. Identify which position you held when you worked with or knew the other person you’re recommending. This list is generated from the positions you defined in your LinkedIn profile. If your experience overlaps multiple positions, pick the position that best defines your relationship with the other party. Define the other person’s title at the time. You have to select at least one position that the other party held to associate the recommendation. You can enter only one recommendation per position, but you can recommend the other party on multiple positions. By answering these questions, you inform anyone reading the recommendation about how you know the person you’re recommending. Perhaps you were the person’s manager at one time. 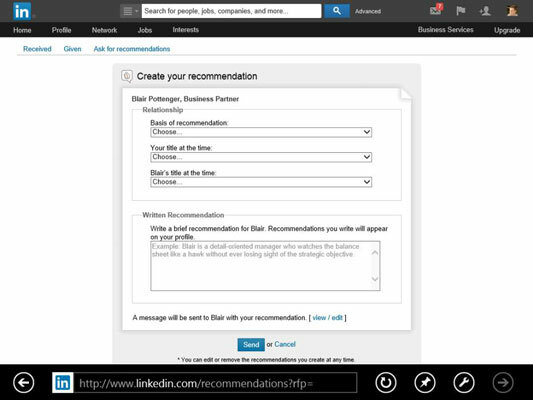 Write the recommendation in the Written Recommendation field. Stay specific, concise, and professional while focusing on results and skills. Keep in mind that recommendations you write that end up getting accepted by the other party also appear in your own profile in a tab marked Recommendations. Believe it or not, people judge you by the comments you leave about others. So, read your recommendation before you post it and look for spelling or grammatical errors. (Optional) Include a note in the Personalize This Message text box. When you send your recommendation, you have the option to also attach a personal note. Simply click the View/Edit link next to the line A message will be sent to Name with your recommendation. If it’s someone you’re in recent contact with, the note is probably unnecessary. But if it’s someone you haven’t spoken to in a while, take advantage of the opportunity to reconnect with a brief note. 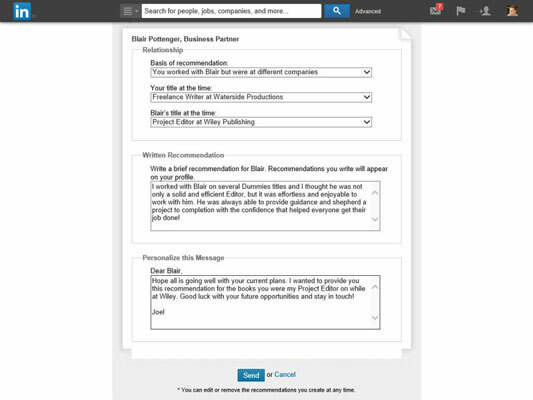 You can keep the boilerplate text, “I’ve written this recommendation of your work to share with other LinkedIn users,” or you can write your own note. Let the person know why you are writing the recommendation, whether it’s because you admire her work, enjoyed working with her, or wanted to recognize her for a job well done. The recommendation is sent to the recipient. After you send your recommendation, the other person has to accept it before it’s posted. Don’t take it personally if she doesn’t post it, or at least not right away. After all, it’s a gift. And if she comes back with requested changes to the recommendation, by all means accommodate her as long as it’s all true and you feel comfortable with it. It’s a service to her, not you.